Before our most recent (and very important) election, I was undecided on who to vote for. 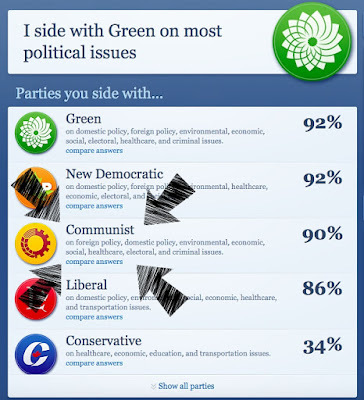 I mean, I knew I wouldn't be voting for the Conservatives (because noooooooo), but I didn't know which of the other three parties would get my "X." Now that all the hoopla is over, I thought it'd be a funny story to share. By happenstance, my brother came for a visit about four days before The Big Vote, and we were discussing the concept of strategic voting, which was a relatively new concept to me. In a nutshell strategic voting came out in full-force this year, in a push to kick out Stephen Harper and the Conservatives (who've been running the country for the better part of a decade), and it encouraged people to vote for the non-Conservative candidate who was most likely to win their riding. A strange way to vote, mostly because in some instances (including mine) you're voting for who you don't want, instead of who you do want. Considering I wasn't sure who I even wanted in the first place, though, my brother suggested I take the same political quiz he did, which he found to be very helpful. "AWESOME!" I declared. Because I love quizzes. Especially ones that tell me which fantasy character I'd be. Haha! I diligently read all the questions, choosing thoughtful responses, but after I got my result, I was a bit confused. Yes, you read that right (both that last part, and the title of this post, haha!). I'd scored a solid 90% with the Communist party. Naturally, this left me feeling like I'd fallen down a fascist rabbit hole of political leanings. Don't get me wrong, I've always been a left-leaner when it comes to government. I support social programs and am happy to pay tax in order to support universal healthcare. I also think that we should, as a collective society, make sure that the vulnerable are protected, and I strongly believe in a woman's right to do whatever the hell she wants with her body. Always. But had I ever self-identified as a Communist? Of course not. And furthermore, I didn't even know that we had a Communist party, in Canada. We're a democracy, so it'd be democrazy for it to even exist. Oh man. See! I find too much humour in dumb fake words to be a Communist. I'd last exactly one second under a Communist regime. Also, I don't like the colour red, like, at all, and I'm pretty sure that all true Communists want an all-red wardrobe, all the time. Add to that my desire for everyone to maintain personal freedom whilst using a hard hand against those who harm others, like violent repeat offenders, white collar dudes who steal money, and people who play Christmas music in the summer, and it just doesn't make sense why I'd identify with 90% of the Canadian Communist party's platforms. 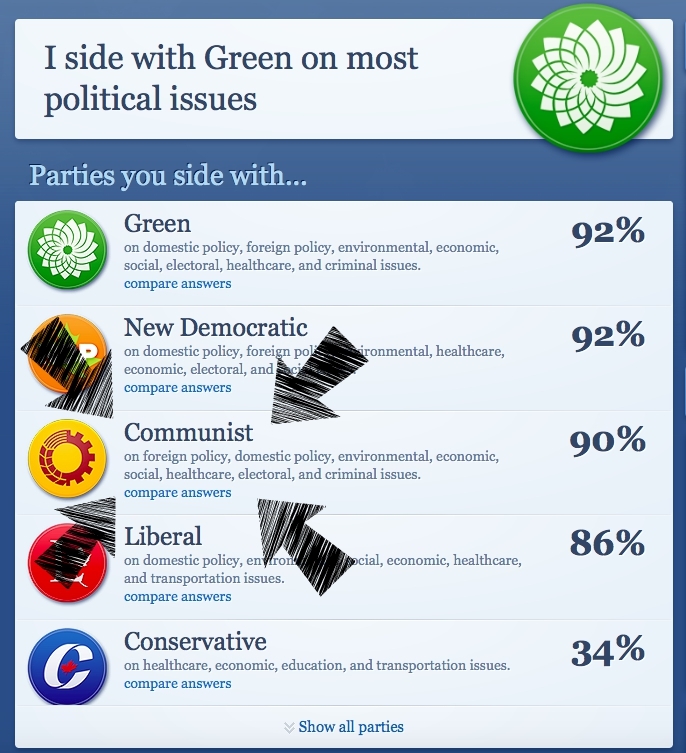 That is, unless the quiz meant that I don't want to be a Communist as much as I want to be in a Dictatorship. Err...with me as the dictator, of course. Holy crap on a cracker, it's so obvious! What a relief! With that decided, I began to think what my term as dictator would look like. For starters, I wouldn't be your run-of-the-mill dictator. That's been done to death. Literally. No, instead of being a no-smiling, hard assed dictator, I'd be a friendly, outgoing one! I mean, when was the last time you saw a dictator crack a joke or give a high-five? Probably never. But I'd change all that: high-fives for awesome people, and karate chops to the throat for the d-bags. Yes! It all makes so much sense, now! I just want to be in charge! And not to brag, but I'm totally the smartest person ever (according to a recent poll of those present in my office, who are pretty much just me and my two dogs), so it's obvious that I'm more than capable of running an entire country without pesky rules and legal regulations stopping me. By the time I whipped everyone into shape, nobody would even miss a democratic society! Rainbow cake with extra sprinkles for everyone (who I don't imprison for super righteous and totally not personal reasons like selling me something but only telling me it's backordered until after my purchase)! So thanks, political quiz! Without you, I never would have discovered my new life goal! 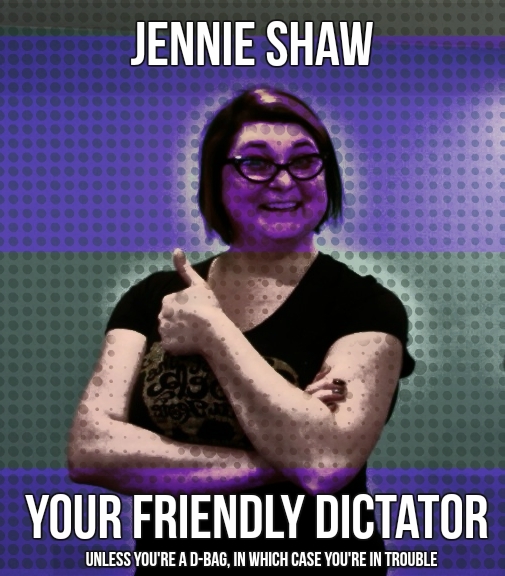 To become Dictator Jennie! Oh yes, that really does sound nice. Haha! Here's a draft of my first propaganda poster. I think it's pretty on the money, don't you? So going to have to take this quiz and see what it say about me. Seriously, though, Communism, like Socialism, is a great concept that plays on fairness and justice. Which if, of course, why it doesn't work in practice. Because most of humanity are d-bags, when it comes right down to it. I really hope you can oust the Conservatives! Feel free to send them south, as the U.S. is apparently now a haven for crazy right wing tea bagger millionaire candidates.